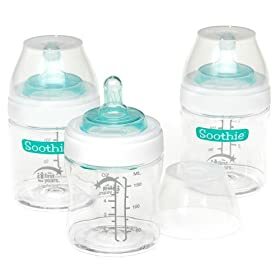 We just got The First Years Soothie Bottles which was exciting because Hila absolutely loves the Soothie Pacifiers and we thought it would heighten her bottle-feeding experience. They're good bottles...I don't really such a difference from the Avent bottles that Hila normally uses, except for one brilliant innovation: The cap of the bottle snaps onto the bottom of the bottle so when you're feeding you don't need to worry about misplacing the cap. Very smart. The bad part -- the cap doesn't fit on the TOP of the bottle! The caps are so loose that I needed to tape it shut so it wouldn't open in the diaper bag! I think maybe we just got a dud of a set. There's no way that they would not know about this problem and have fixed it right away. So should you buy these? Just check to see if the cap fits snugly. If it does, then you definitely should. All bottles should have the caps attach to the bottom. What a great idea! Wish I would've thought of it! Some types of bottles (I know the first years breast flows, for example) also come with a little formula compartment that snaps onto the bottom of the bottle so that you can pre-measure the formula and be on your way! Brilliant! You should call customer service and see if they can do anything. We had an issue w/our Playtex bottles, and they immediately sent new ones to my parents.